So before I go back in time to share some of my summer (and pre-summer – eek!) projects, here’s one that I just finished last week. My daughter recently turned two and we threw a casual little park get-together for some of her kiddo friends and their parents. Around the same time that I was planning her party, I stumbled upon small + friendly’s new-sew crayon wrap tutorial. I thought it was genius! What a simple project to make and perfect for parents of toddlers to whip out at restaurants or whenever they need to distract their little one. I decided I wanted to make them as part of the party favor for Yuki’s birthday party! But could I keep it simple? Could I keep it no-sew? Nooooooooo . . . obviously not. I had to go and make it all difficult for myself. Hah! Well actually, though did make a few changes and add a few steps, it was still a super simple project and I was able to whip up 17 of these crayon booklets pretty quickly. AND I had all the materials I needed already in my stash (except for the crayons), so that was a big plus! 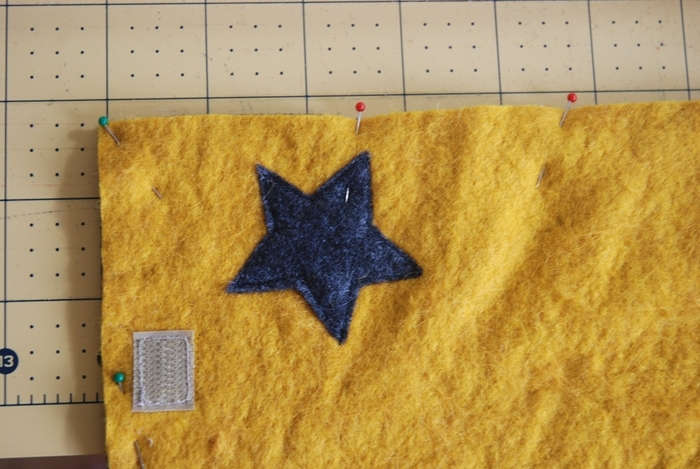 First, Carla mentions in her tutorial that if you want to thicken your felt to wash it in hot water, put it in the dryer until almost dry and then iron. My yellow felt was wool, so I decided to give it a try. But something went terribly wrong! After washing it, I noticed that the felt was totally coming off in clumps. It was pilling and crazy-uneven-fuzzy all over and definitely not any thicker. I threw it in the dryer anyways, but it looked the same when it came out. I didn’t really take a picture of what it looked like right out of the dryer and after ironing, but here’s what it looked like after I picked off a lot of the loose felt (that ball of fuzz is all the stuff I picked off by hand). Wool felt isn’t cheap, so I wasn’t about to abandon it. I just picked off as much as I could and smoothed the rest down with my hands and in the end, I don’t think you can tell at all on the finished product. It definitely wasn’t any thicker though and I have no clue what I did wrong. Any ideas? Has this happened to you? Using your blade, cut through the lines on your paper template. 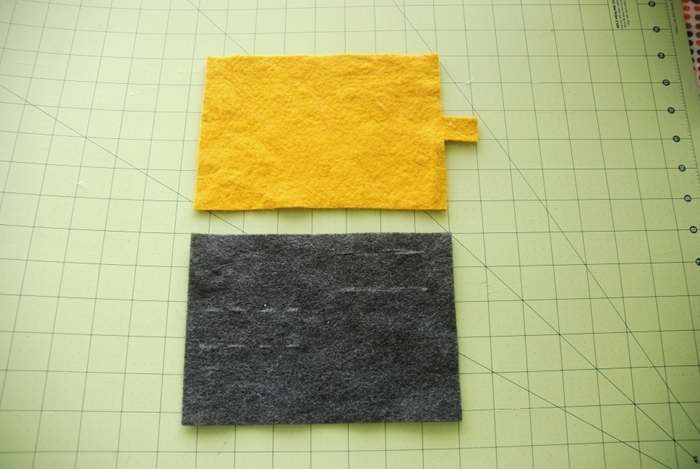 Cut a 5.25 x 7.5 inch rectangle from your inner felt. Lay the template on top and mark the lines using chalk or a disappearing ink pen. Cut those with your blade. 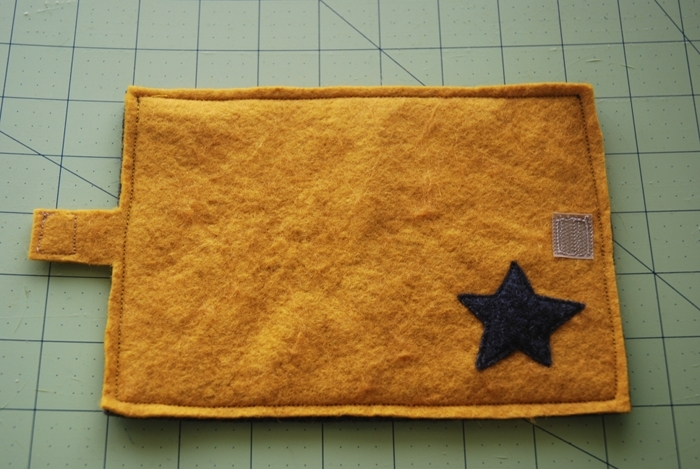 Using your template as a guide, cut another rectangle WITH the closure tab from your outer felt. On your outer felt, feel free to add an applique or any other decorations. Sew one side of the velcro to the tab and the other to the opposite side of the cover about a 1/4 inch away from the edge. Pin the two layers of felt together with wrong sides together. Make sure that when you open up the booklet the crayons slits are on the left and the paper slits are on the upper right. Sew around the edge in a rectangle. Your booklet is done! Now to add the goodies . 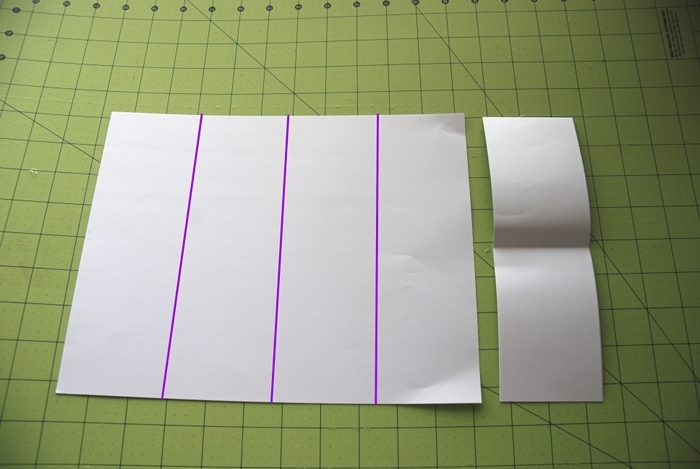 . .
Cut your paper into fourths along the long edge of the paper. 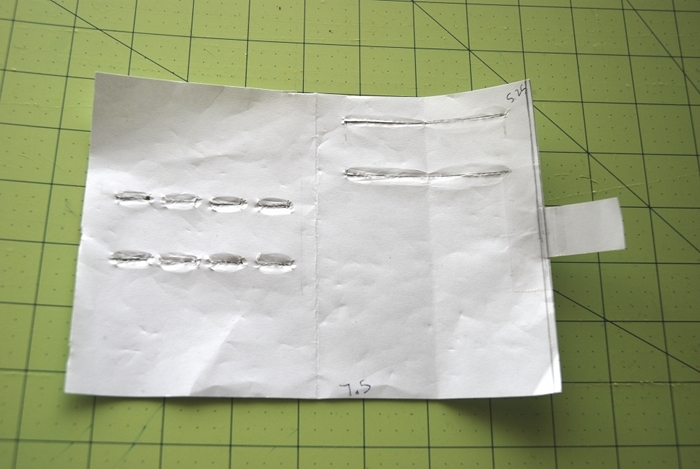 Each strip should be 2.75 inches wide. Stack the 4 strips and fold them in half. And you’re done! Pretty simple, right? Thanks to Carla for the fabulous inspiration and tutorial! I’ve stashed one of these in our diaper bag and I imagine I’ll be whipping it out quite often. What kinds of “distractions” do you keep on hand to keep your child entertained? My sister-in-law was the one who taught me to ALWAYS have paper and writing utensils on hand (for any age kid). And you know what she carries in her purse and has entertained children for loooong periods of time? A balloon! Deflated, of course. Serious (long lasting) fun can be had with a simple balloon. Genius. Happy sewing and have a great weekend!! 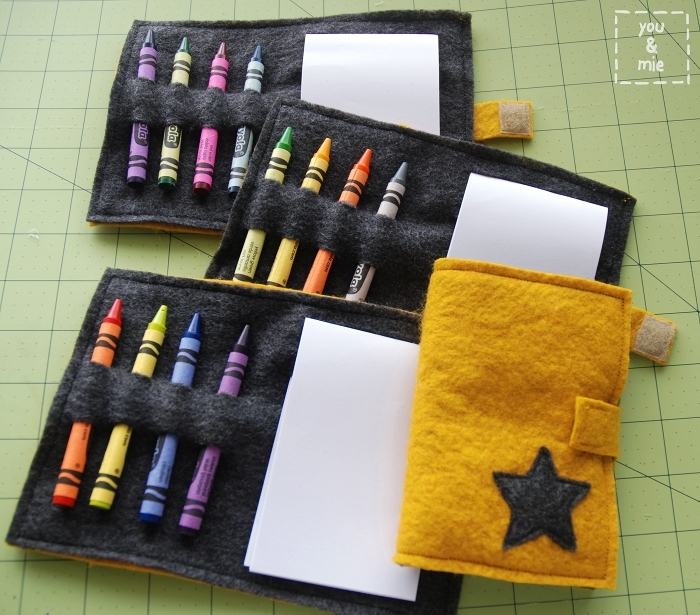 This entry was posted in other, sew & tell, tutorials and tagged crayon booklet, crayon wrap, felt, kids, tutorial by Cherie. Bookmark the permalink. Those turned out great. I’ve been trying to figure out why your felt turned out funky & have no idea. I love how yours came out! Simply adorable! I’m so sorry that happened to your felt, I learned that trick from someone who used to work at a fabric store, that has never happened to me before. I’m too cheap to buy 100% wool, I always use a blend, maybe that’s it? What a clever little project and soooooo much more useful that a typical goodie bag at kids parties. As for your felt – wool felt does that. I actually think it came out great for that project but if you are going to use it for applique on a quilt or other types of projects like that, don’t wash it. Thanks!!! I hadn’t tried it before so I didn’t know if it was normal. It certainly worked out fine in the end, but yes, I can see how it wouldn’t be an ideal look (the fuzziness) for some projects. Love this. Have never made anything with felt but love the texture of it – it just makes anything so cosy 🙂 Love the colours too. LOVE these!! super super cute! Oh, what lovely favors!! Sometimes I feel like I get excited about bday parties just so I can spend countless GUILTFREE hours on Pinterest gathering ideas. These are so adorable! Wish I knew what happened with your felting issue . . . I”ve had pilling before, but never to that extent. Perhaps simply the way that particular sweater felted? Don’t stop trying though – it’s fun! i love these! love that you didn’t leave them “no sew,” too – i would’ve done the same thing. sewing just feels so much more secure to me. love that yuki has her own little signature symbol, too – pretty great! These are really great and I enjoyed your entertaining tutorial. Thanks! 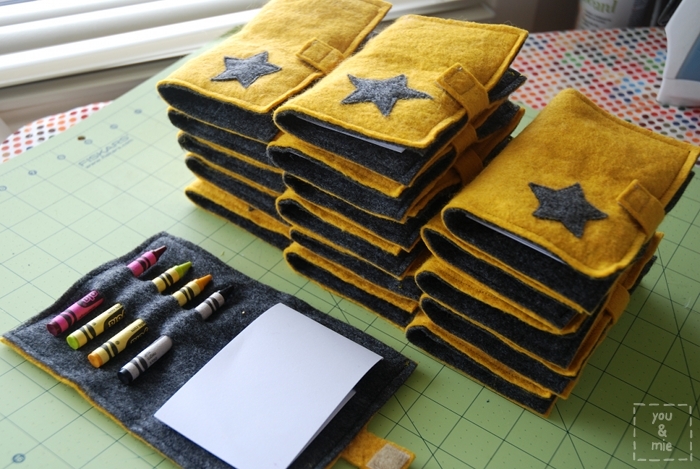 What a wonderful little carry along project for the little ones. I made sure to pin it to my Pinterest page. Thank you. I love that ! I will definitely make a few (probably not 17, though !) for my kids and for gifts. 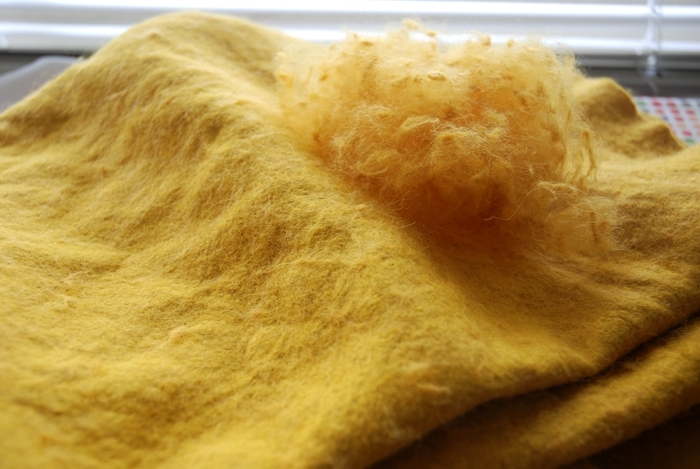 I had good results with wool felt just by wetting it and then putting it in the dryer. Maybe try it next time ? It looks great like it is, I think ! Hi very cute by the way! With wool felt you dont want to put it in the washer you would soak it in very hot water. Swish it around a couple times and then rinse well in cold water. Felt will fall apart in the washer. But definitely put it in the dryer on hot. The longer in the dryer the more it felts. I hope this helps you in the future. HAPPY FELTING!!! Ooh, thanks for the tip!! cool idea. I’ve been trying to find something both stylish and functional to carry crayons and paper in. I randomly find crayons in the bottom of my purse. These are so great!! I’m going to attempt to make these for my son’s birthday party favors. So much better than nicknacks that add up ($) and end up lost and/or in the trash. Wish me luck!! Thank you! We still totally use ours a year and a half later! Good luck and I hope the kids and parents appreciate them! Wow, that is such a cool idea! I love this idea. Yours turned out so cute! 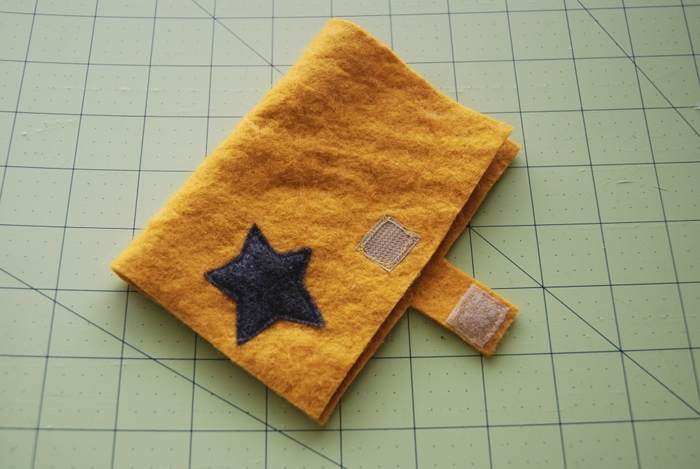 Did you end up needing any card stock or anything in-between your felt? Or did you find they had enough weight behind them to draw easily enough? I didn’t put anything in between, but it’s pretty flimsy, so not sturdy enough to draw on unless you’re using a hard surface like a table.